Lentil soup is my favourite dish when I need something comforting but quite ascetic. There has been a lot of socialising over the weekend and I am feeling a little sluggish. When Dave and I crossed Turkey on our motorcycle in 1997, lentil soup was essential to our survival as the weather was so cold. They serve it for breakfast in huge bowls with a whole loaf of crusty, white bread on the table. It is unbeatable as a breakfast dish on a cold day. I never vary the way I cook this. I am so attached to the way it tastes that I would not want to spoil my simple recipe. However, you can use either split red lentils or chana dahl. Both are equally as good. Chana dahl needs to cook for longer and you get a firmer consistency with the lentils. This works well in the pressure cooker if you are in a hurry. Place all of the ingredients in a saucepan and bring to the boil. Cover and simmer for 35 minutes for red lentils or an hour for chana dahl. Season to taste. 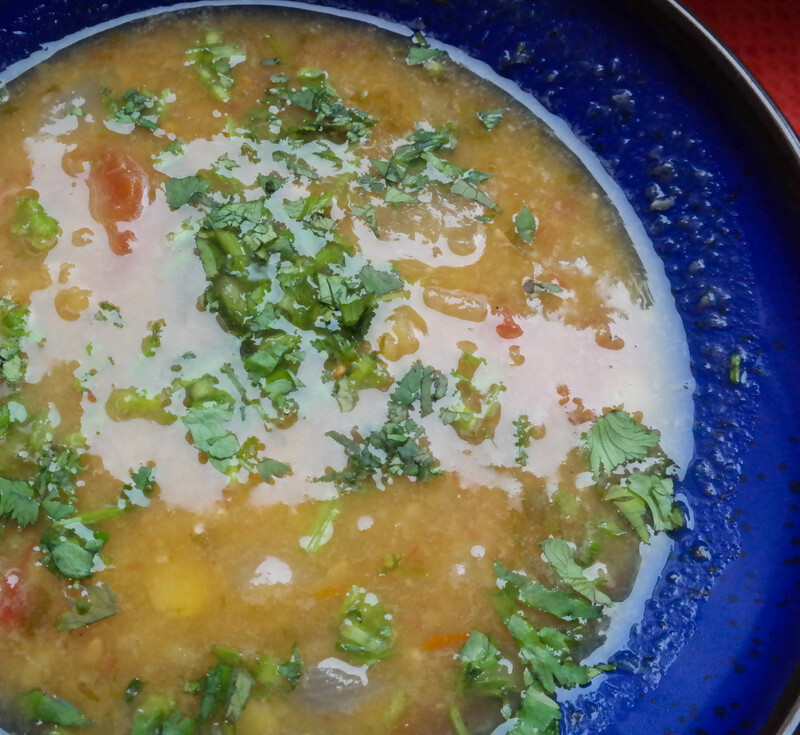 If using chana dahl, take two cups of the soup and blend before returning to the soup. 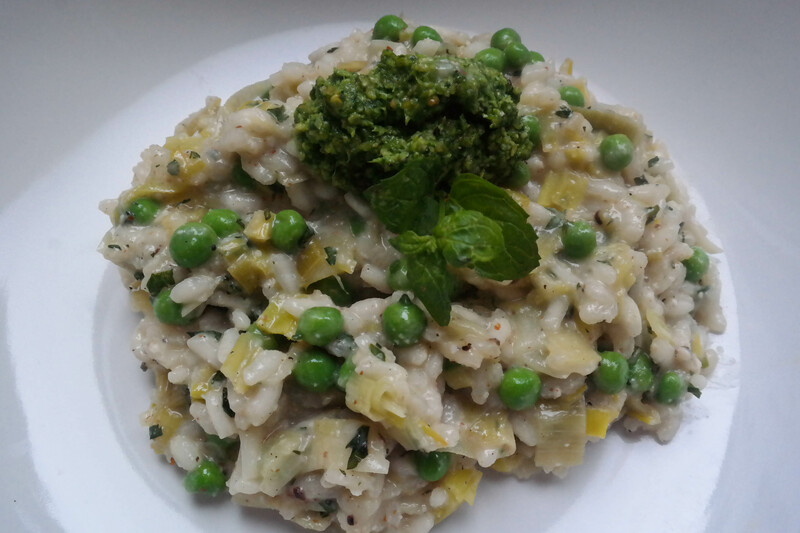 Serve with a squeeze of lemon juice and garnish with more fresh coriander. This week I am trying to focus on quick, easy recipes that anyone can make and enjoy in 10-15 minutes as I am back at work and still eating alone. Vegans get hungry easily and a good breakfast is essential. I often eat hummus or avocado on toast in the morning. I got the idea of avocado on toast as a breakfast dish in Chiang Mai, Thailand where there are some great veggie cafés. Served with a banana and coconut smoothie it provided a great start to the day. 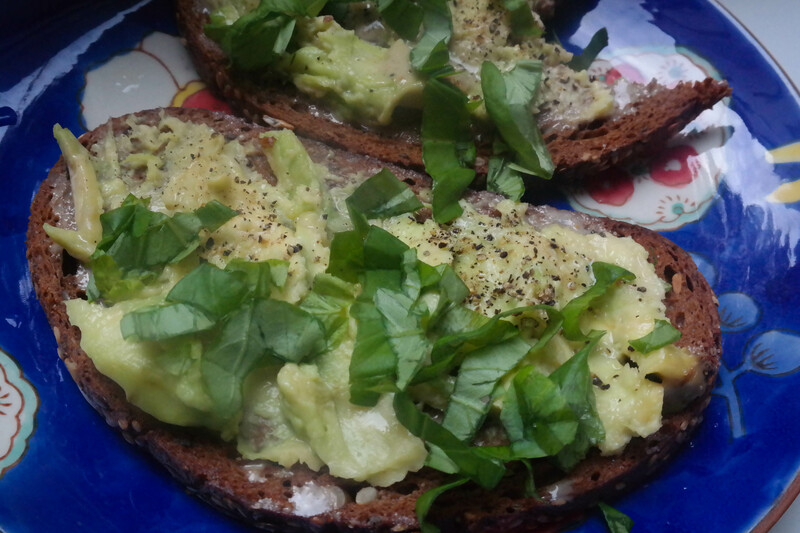 I have used tahina for extra flavour and protein here but pesto also works well as a layer under the avocado. It is also delicious topped with slices of tomato or sprinkled with sesame seeds or linseeds or indeed chopped walnuts. Spread the toast with the tahina. Mash the avocado with a fork and add the lemon juice and season. Spread onto the toast. Garnish with basil leaves. Hummus is the quintessential vegan good. In our house we eat it almost every day. Even Dave, who is not given to much food preparation, has his own recipe. 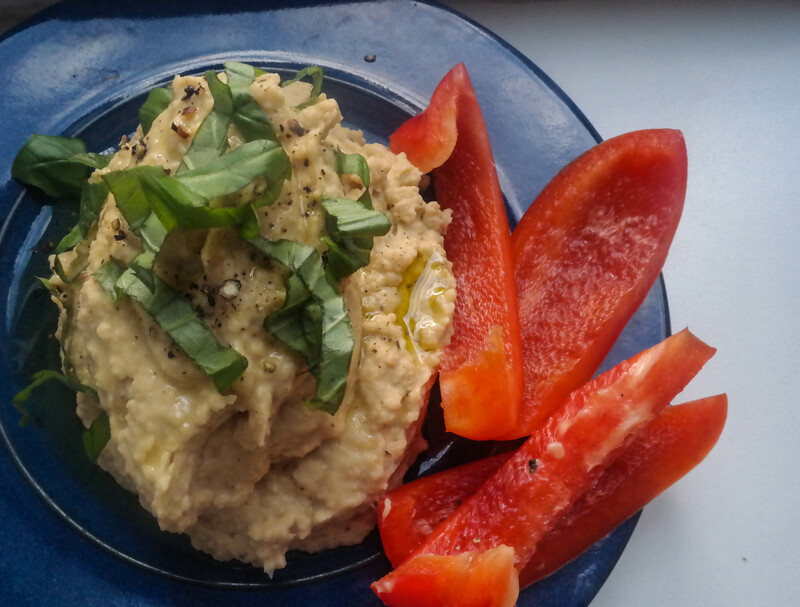 Hummus can be made in many different ways but here I use chickpeas that are used traditionally in the Middle East. Interesting that traditional recipes do not use olive oil but instead add much more tahina than we use at home. I think the olive oil really adds to the creamy consistency and, as a vegan, you have to get your calories somewhere. You can easily double up on the quantities here for a larger number of people or if you are just greedy. Blend all of the ingredients in a blender. You will need go shake it a few times or stop to stir. You can add a little water to get it moving if you need to. I am cooking for one at the moment and prefer light, fresh and easy dishes. Dave cannot eat avocado so I try to eat it with everything when he is not here. You could use shop bought or homemade vegan pesto instead of hummus. I used the pumpkin and avocado hummus that I featured yesterday. You could garnish with fresh coriander for a different kind of fresh taste or even add some dried chilli flakes. Gently heat the oil in a wide frying pan. Gently fry the mushrooms and onions for about 7-8 minutes. Add the tomatoes and cook for a further 2 minutes. Season to taste. Meanwhile toast the bread. Cut it in half and cover with the hummus. 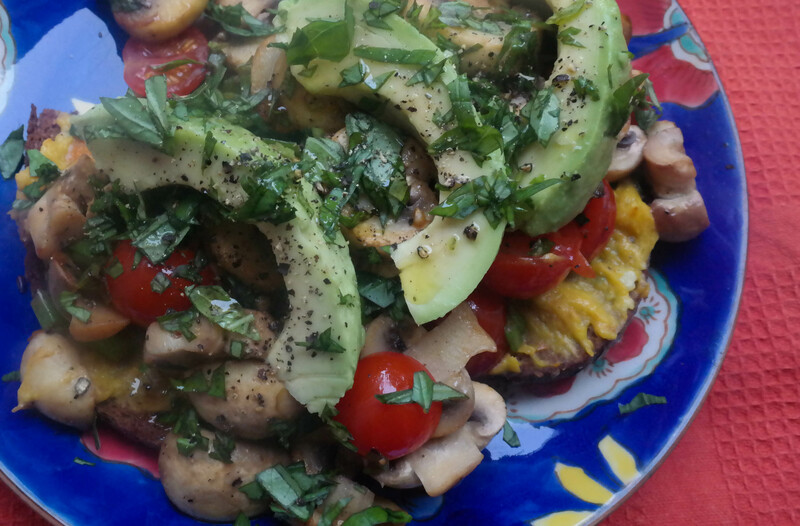 Spoon the mushroom mixture onto toast and place the avocado on top. Sprinkle on the basil.